No Bake Peanut Butter and Nutella Cookies– Oatmeal, Nutella and Peanut Butter mixed together with butter, sugar, milk and vanilla. This recipe is for the Peanut Butter Bash group that I am a part of. If you’re blogger and love peanut butter as much as we do, then check out our FB page. You know what happens when you mix peanut butter , nutella and oats? You get one heck of a cookie! I’ve always loved no-bake cookies. They were on the school lunch menu frequently and I was always excited when they were. I adjusted my “go to” peanut butter no back cookie recipe in order to make these delicious no bake peanut butter and nutella cookies. My auto correct wants me to type nutshell rather than nutella! There’s a warning for ya, if you see the word nutshell, I am referring to nutella! 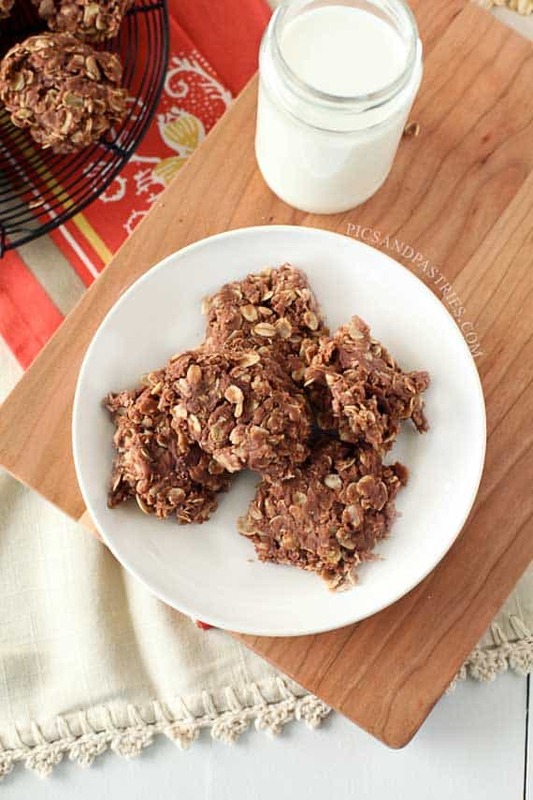 These No Bake cookies make a great lunch or snack cookie. Make some at the beginning of the week and send a couple with your kid’s lunch. If peanut butter is allowed, of course. I love that these cookies don’t have a definite peanut butter or chocolate taste to them. They flavor just blends together really, really well and you’re left with a yummy cookie. No Bake Cookies are quick to make. The longest part is waiting for them to “set.” I roll out wax paper and just drop them by two spoonfuls into mounds. Then, walk away for about a couple of hours. An hour and a half should be plenty of time. This allows the cookie to hold it’s shape, otherwise you’ll be eating these with a spoon. In a large saucepan mix sugar, butter, and milk. Bring to a full boil over medium heat. Remove from heat and stir in peanut butter, nutella and vanilla. Stir until the nutella and peanut butter are melted and fully incorporated. At room temperature allow to cookies to rest until firm. About an hour or two. Check out all the other yummy peanut butter and nutella recipes! Wow This is one of my favorite cookies not to mention now making it with Nutella! Thanks for the recipe, will pin it as well!!!! What a fun and easy recipe! The flavors sound fantastic! These sound awesome and I love that they are no bake perfect as we get into the warmer months! These look and sound amazing! I love eating both Nutella and Peanut Butter, the perfect combo! Yum yum yum! I love no-bake cookies. I could only imagine what they taste like with nutshell.. err I mean nutella. haha kidding! You always bring some amazing recipes over to the #peanutbutterbash! When I saw no-bake, Nutella AND peanut butter I had to rush right over. You’re speaking my language. Looks divine! What a perfect cookie! I love the addition of Nutella!